Sugar has quickly become the single worst ingredient in the modern Western diet. Science has now shown that sugar is taking a devastating toll on the health of the population and is leading to wide spread obesity, heart disease, diabetes, liver disease and a host of other closely related illnesses. The single largest source of calories in the standard western diet comes from sugar—specifically high fructose corn syrup. 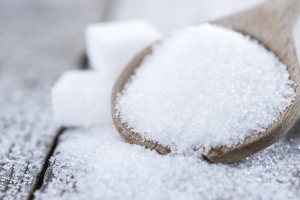 In 1700, the average person consumed about 4 pounds of sugar per year. By 1900, individual consumption had risen to 90 pounds of sugar per year. In 2009 that figure rose to 180 pounds of sugar per year which is equivalent to half a pound of sugar per day. Sugar is loaded into soft drinks, fruit juices, sports drinks, and hidden in almost all processed foods on the supermarket shelves. Anything labeled low fat or zero fat is generally loaded with sugar and even things labeled sugar free, are instead filled with artificial sweeteners that can be equally as detrimental to the body as sugar itself. Empty of Nutrition- Added sugars (like sucrose and high fructose corn syrup) contain a great deal of calories with NO essential nutrients. For this reason, they are called “empty” calories. There are no proteins, essential fats, vitamins or minerals in sugar- just pure energy. These empty and quickly digested calories actually pull minerals from the body during digestion and contribute to major nutrient deficiencies in the body. Liver Disease- Before sugar enters the bloodstream from the digestive tract, it is broken down into two simple sugars: glucose and fructose. Fructose can only be metabolised by the liver in small amounts. In excessive amounts, fructose overloads the liver, forcing it to turn the fructose into fat. When fructose gets turned into fat this can lead to liver disease. Insulin Resistance and Diabetes- Insulin is a very important hormone in the body yet having too much glucose in the blood is highly toxic. When sugar is consumed in large amounts the insulin stops working as it should and can lead to insulin resistance in the body. When our cells become resistant to the effects of insulin, the pancreas tries to keep up with the demand, eventually resulting in a diagnosis of type II diabetes. Increase risk of Cancer- Cancer is one of the leading causes of death worldwide and is characterized by uncontrolled growth and multiplication of cells. Insulin is one of the key hormones in regulating this sort of growth. Thus having constantly elevated insulin levels (a consequence of sugar consumption) can also contribute to cancer growth. Obesity and Heart Disease- The way sugar affects hormones and the brain is directly linked to weight gain. The addictive nature of sugar also leads to a decreased satiety which triggers an over consumption and dependence on sugar for people to get through their day. Sugar both drives fat storage and makes the brain think it is hungry, setting up a vicious cycle that people tend to feel helpless against. A raw food diet is naturally delicious and the sweeteners that come from nature, although not to be consumed excessively, often have a wealth of benefits to offer the body also. Fresh dates, dried fruit, wild raw honey or agave syrup are all wonderful sweeteners that can be used to add to recipes and desserts. As you let go of refined sugars you will also find your body craving more fresh foods. You will also begin to notice that foods you may have never once considered to be sweet such as apples or pears, soon begin to have a beautiful sweetness to them that only nature can perfect. 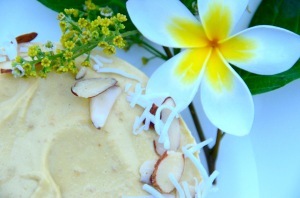 With summer now upon us, it is the perfect time of the year to try this Raw Mango Cheesecake. This is a smaller cake which is perfect for 2-4 people to share, or you can keep it in the fridge for 4-5 days and enjoy it as you please! Process all ingredients in your food processor until they are broken down and everything comes together. The mixture should be sticky and hold its form but still have texture. Press the base into a 9 cm spring form cake tin and place in the fridge while you make the filling. Pour the filling over the base and place in the freezer for 3-4 hours to set. This recipe fits a small 9cm cake tin, for a larger full size cake simply double or triple the recipe. After 2-3 weeks of being sugar-free, it becomes apparent how detrimental it was to our health before, and we did not even notice it at the time… Also, in those rare occasions where adding sugar is inevitable- replace it with honey! I have only recently realised the dangers of eating hidden sugars, I thought I was pretty health, but with all the publicity around sugar these days I thought i’d do a bit of a reviwe of what I was eating and sure enough there was a lot of sugar I didn’t even realise I was eating. I feel so much better for it and one of the biggest differences I have noticed is in my mood. I don’t have the ups and downs and cranky pants episodes that I used to have. Win! Liver Disease- Before sugar enters the bloodstream from the digestive tract, it is broken down into two simple sugars: glucose and fructose.